Synergy Vision is demystifying medcomms – and helping to shape the next generation of medical writers, and client services and events professionals. 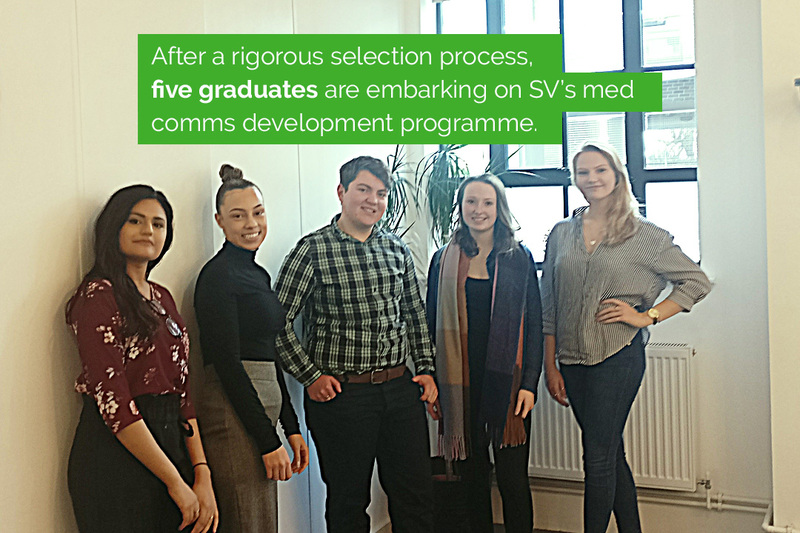 SV has run a biennial development programme for graduates since 2014, showcasing medical communications to graduates to identify new talent and providing structured opportunities for those they recruit. This year, after a rigorous selection process and induction, five graduates are embarking on SV’s structured training for new entrants to medical communications. An initial, comprehensive 4-week training programme provides the graduates with an overview of agency life, including sessions from the editorial, accounts and operations teams. They will learn about the pharmaceutical industry and medical communications generally, as well as develop department-specific skills such as medical writing, and ‘soft skills’ like time-management and presenting, which are key to working in a fast-paced agency environment. Many of the modules are delivered by external experts, while weekly tasks ensure they put their training into action and embed their learning from the outset. Look out for posts by the graduates on SV’s blog and social media, as they provide an insider view and show off their new skills. Over the coming months, the graduates will also enjoy rotating around each of the agency departments, giving them a real understanding of all the business area needs and bringing context to their work wherever they settle. SV invests in the development of its people throughout their careers, recently launching a senior development programme to augment the personal development plans already embedded in the company’s culture. It will roll out through 2019, with six mid-level managers enjoying individualized, blended learning to hone their management and leadership skills. You can read more about the tailored programme here.